The province of Rheinland-Pfalz covers an area of 19,800 km2 with only 3.7 million inhabitants. Historically Rheinland Pfalz converged from three regions comprising the Prussian Rhine province, the left Rhine area of Hessen and part of the Bavarian Pfalz. 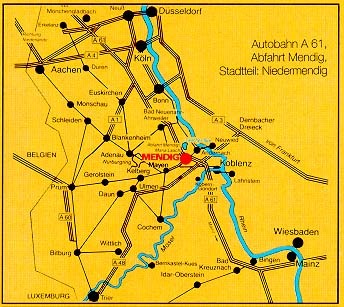 The three main cities of Rheinland Pfalz are its capital Mainz with 186.000 inhabitants, Ludwigshafen with 171,000 inhabitants and Koblenz with 109,000 inhabitants. 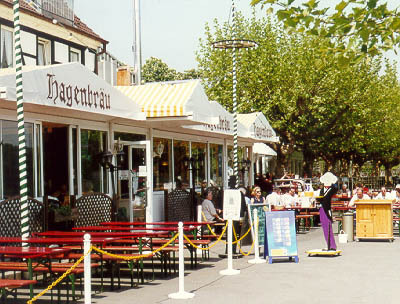 One of the largest Brewing concerns in the area after a 1995 merger is the Park and Bellheimer Brauerei, Karl-Silbernagel-Str. 20-22, 76756 Bellheim. Unfriendly and unhelpful staff plus a beer range which now includes delights such as Blacky (Beer and Cola mix) means that their products are best avoided at all costs. Fortunately you can still discover the delights of over 20 regional breweries and brewpubs in this guide section for Rheinland Pfalz which have been picked for their beer quality and choice of beer styles. Return to the Main Menu for detailed maps and lists of the areas covered or just start reading below for the first part of the Rheinland Pfalz section. 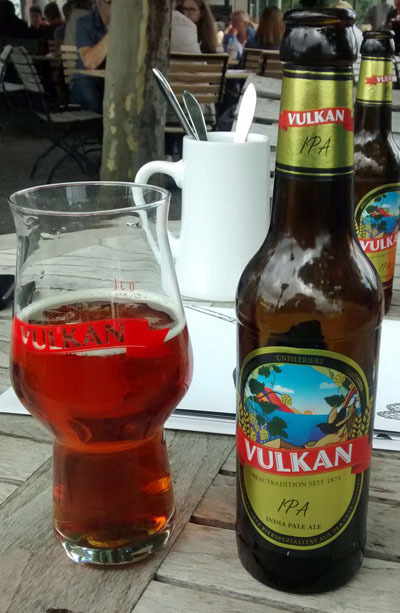 Something hot is brewing around here at the Volcano Brewery situated near to Koblenz at Laacher See Strasse 2, 56743 Mendig, Tel: 02652 520330, Fax: 02652 4215. 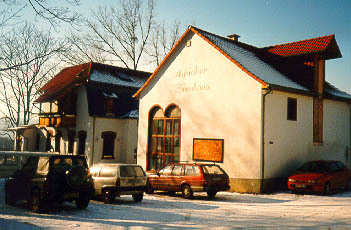 Formerly the Wölker brewery which dated from 1875, this has now been turned into a brewpub which caters for the many visitors to the region. Between 13000 and 11000 years ago a massive volcanic eruption gave rise to 6 km3 of erupted magma and the resulting collapse of the volcano created what is now the Laacher lake. The basalt lava flows were mostly deposited around Mendig and these have been mined for centuries creating huge caverns which were ideal for brewers before the invention of cooling machines. In fact at one time there were 28 breweries using these caves for cooling and storage although the volcano brewery is the only one left today. Visits of about 1 hour long arranged by the brewery can be made to the caverns which are claimed to be deepest lagering cellars in the world. These visits require one to descend 153 stairs down to 30 meters underground and take place on Saturdays and Sundays at 16:00 at a cost of 5 DM per person.. 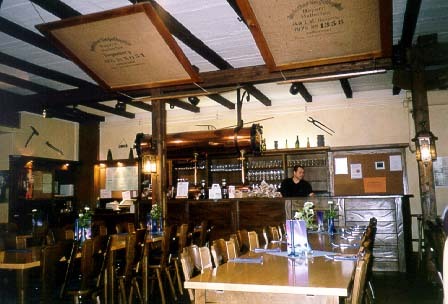 The brewery which is open from 11:00 to 23:00 every day consists of a very large main bar area which is built in the old barreling building and still contains an original working 100 year old barrel washing machine. The beergarden contains a working original crane from the old basalt mining days. As for beer, the range and quality has improved enormously over the last years. The Helles is a Pils type beer which is slightly tart and bitter, quite drinkable although unexceptional. The Dunkel is extremely dark which promises full flavour and delivers as expected. A fine example of the style. Both brews also have a tendency to be served rather cold and certainly benefit from a little warming before tasting. A real treat if available is the seasonal India Pale Ale IPA which is one of the finest examples of the style and rarely found in Germany. Everyone who tasted it was astounded by the complexity of this beer and just how well balanced it was. A connoisseur drinkers delight from start to finish. Features as one of the best beers in this guide. A very complete and varied menu is also available. See the brewery's Website for more details. Information about the Volcano Park and the many walks which can be made in the region are available in German here. 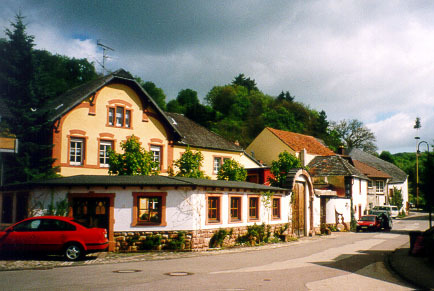 The town of Lahnstein lies just south of Koblenz in the northern part of Rheinland Pfalz. 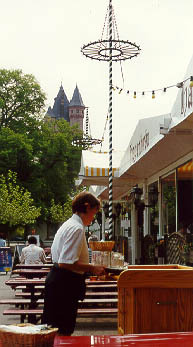 Situated on the river Rhine the town is home to three breweries two of which are homebrew pubs. 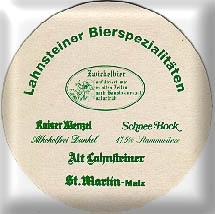 The larger Lahnsteiner Brauerei (Formerly the St. Martin brewery) can be found in the Sandstrasse 1, Tel: 02621 91740, Fax: 02621 917434 and they produce a wide range of interesting beers. These include a very good full flavoured Fürsten-Pils as well as Alt-Lahnsteiner, Jäger Bock and the interesting Schnee Bock which is available from October to March. This dark bock is named after the old tradition of 'Ice Bock' where the beer was cooled until ice formed around the edges of the lagering tank. Because the water content has a different freezing point from the alcohol the strength of the beer increases as water is removed by the freezing process. Unfortunately the brewery no longer uses the old technique and brews to a higher strength from the start, only keeping the name in memory. 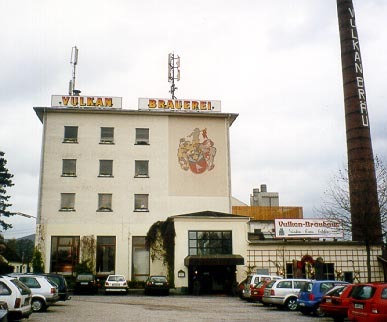 The last brewery to produce real 'Ice Bock' in Germany was the Reichelsbrau in Kulmbach, but they have also stopped producing the beer since their 1998 merger with the EKU brewery in the same town. Another interesting beer from this brewery is their 'Zwickel' which gets its name from the tap used to sample beer from the lagering tank, known as a 'Zwickel'. Because the beer is taken directly from the fermenting or lagering tank and is therefore unfiltered it is given this name. 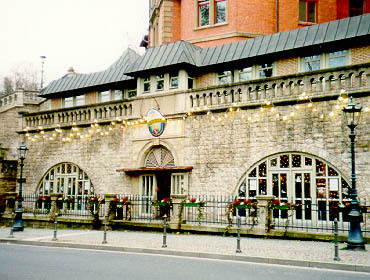 Zwickel beer can also be found at the Zum Stiefel in Saarbrücken. 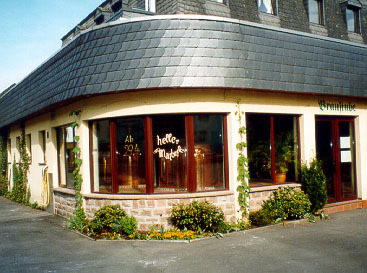 The Lahnsteiner brewery also has its own web-site where you can find out more information and the site also has a location map as well as some information in English. 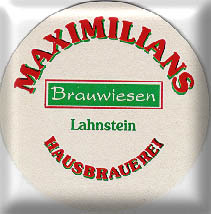 The 1995 founded brewpub Maximilians Brauwiesen can be found in the Industriestrasse, 56112 Lahnstein Tel: (0 26 21) 92 60 60, Fax: 92 60 61. The pub is open every day from 11:00 to 01:00 and has a warehouse sized beer hall as well as another smaller room which can together seat 700 guests. The beers available include an average Helles, a more tasty Braunes, Weizen and seasonal brews. The Christmas Bock was already unavailable before Christmas showing a somewhat disorganised attitude towards speciality brews, so telephone ahead to make sure of what is available before making the trip. Further information can be obtained from the Maximilians own web site. 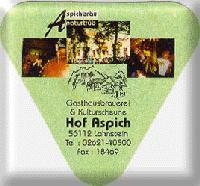 A third brewpub in Lahnstein is the Gasthausbrauerei Hof Aspich which can be found in the Hof Aspich, Kurzentrum, 56112 Lahnstein Tel: 02621-40500, Fax:02621-18469. Open from 11:00 every day the pub can seat 120 guests as well as having place for a further 800 outside during the summer. !!!! This Brewery is now closed !!!! Mainz capitol of Rheinland-Pfalz is a large city spread around the junction of the Rhine and Main rivers. The outskirts of the city flow into Wiesbaden and even Frankfurt-am-Main forming one of the largest and busiest conglomerations of cities in Germany. 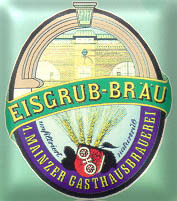 The Eisgrub brewery also known as the First Mainzer Gasthausbrauerei established in 1989 is centrally located in the Old City 'Altstadt' area of Mainz in the Weißliliengasse 1a, 55116 Mainz, Tel: 06131 221104, Fax: 06131 234558. Occupying the premises of the old city ice storage cellars, this friendly brewpub is well worth a visit for its excellent beer and atmosphere which is in stark contrast to many of the more modern brewpubs. 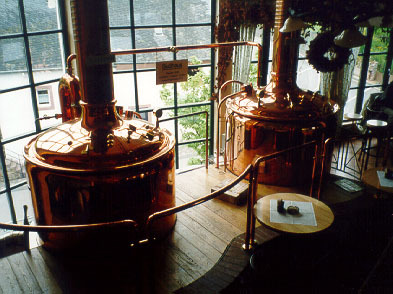 Brewer Burghardt Kühn produces two beer types which undergo 4 weeks lagering. 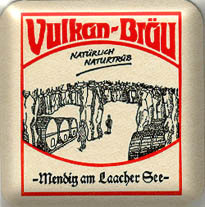 Served in stone mugs at a good temperature, the Helles Märzen has a good märzen type flavour and is smooth and malty. The Dunkles Pils is an interesting and unusual light brown, intensely bitter beer of good quality. The arched shape of the cellar means that one can hear most of the conversations echoing from the other tables and makes it a good place to study how life goes on in Mainz. If you're feeling really thirsty then try the 'Eisgrub Meter' which is a long wooden plate loaded with 12 beers. Open from 09:00 to 01:00 every day except Friday and Saturday when they open until a very late 02:00. The Eisgrub now has its own Website. See also the Internet site, Mainz available in both German and English. 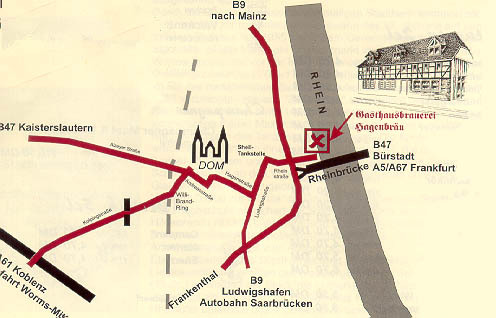 On the other northern side of the river Rhine the area is known as Mainz-Kastel and it is here that the 1990 established Castel brewery can be found in the Otto Suhr Ring 27, 55252 Mainz-Kastel, Tel: 06134 24999, Fax: 06134 62709. 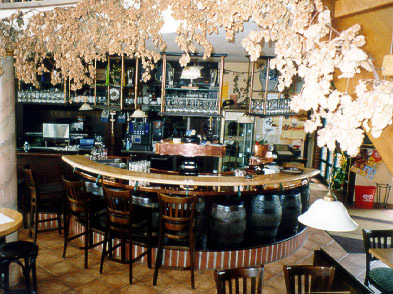 Open daily from 11:00 to 24:00 the brewery produces a Helles, Dunkles, Hefeweizen and other seasonal beers. The Helles is a good drinking Pils type with only moderate bitterness. The Dunkles has a burnt copper or Ruby colour and has more flavour as well as being slightly sweeter than the Helles. The winter Bock is a stronger version of the dunkles with a darker colour and a slightly dry aftertaste. Very popular in the evening the pub is well worth a visit as they also serve reasonably priced local food such as Mainzer Spundekäse with Brezel and they make their own Castel Bierlikör digestive to finish off the evening. 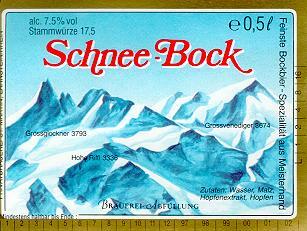 It should be noted that the brewery changed hands in March 2001 and is now run by the Sonne family. One of the major changes is that there is a new brewer Friedrich Schulte, and consequently the brewery has introduced a wider variety of seasonal beers. The Castel brewery has also introduced its own Website which is very informative and is the place to look for dates of special events and which seasonal beer is likely to be on tap. 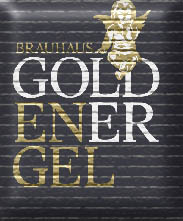 To the West of Mainz lies a modern brewpub named Brauhaus Goldener Engel which has already won numerous awards. Located in the commercial district close to the Rhine the brewpub can be found in Neisser Straße 1, 55218 Ingelheim, Tel: 06132 899 4800, Fax: 06132 899 480 28. Open every day from 11:00 to 01:00 the brewpub also features a large separate 600 seat beergarden (open in fine weather) and many events featuring traditional, jazz and modern music. Very popular brewing seminars are regularly organised from 10:00 – 16:00 at a cost of € 55,00 per Person and this price includes drinks plus "Haxe" with cabbage (See website for dates). Beers include a Pilsener style, dry hopped Helles, Stammwürzegehalt 11,7 %, Alc. 4,9 %, Dunkles, Stammwürzegehalt 11,9 %, Alc. 5,0 % and seasonal Maibock, Stammwürzegehalt 16 %, Alc. 6,3 % (all bottom fermented). A top fermented traditional Weissbier, Stammwürzegehalt 12,4 %, Alc. 5,4 % is also produced. To the North of Trier, deep in the countryside, a new brewery has opened in the village of Naurath at Waldstr. 1, 54340 Naurath/Eifel, Tel: 06508 91710, Fax: 06508 1616. 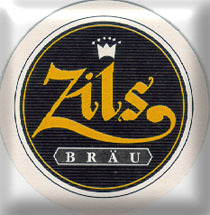 The Zils Bräu is in a very pleasant location and the interior is particularly well laid out and welcoming. A sometimes functioning Website is also available. Beers include a very pale, light, thin, unfiltered Helles which is refreshing although undistinguished and edges towards a Pilsner style. Also available is a dry slightly malty Dunkles which in fact is not very dark at all and is rather too thin and dry for this style, more of a light Alt beer. The brewery also produces a rather highly carbonated Weizen, which has a pronounced banana aroma and taste which lingers, and although also rather thin, this Weizen has the most character from all the beers. Overall the Zils brewery produces good quality beers which unfortunately really need some more individual character to make them worth going out of the way for. Zils also has its own Hotel, which is quite convenient for exploring the area which has a well laid out network of walking paths. Here is an address which is really worth going out of your way for. 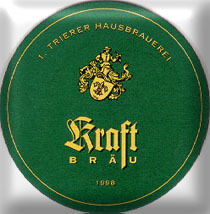 The 1998 founded Kraft Bräu brewpub is situated in the Hotel Blesius Garten which can be found in Olewiger Str 135, 54295 Trier, Tel: 0651 36060 Fax: 0651 360633. With its own somewhat limited (as concerns brewing) Website this is one of those rare places which combines excellent beer, food and accommodation. A 15 minute walk from the Hotel will take you to the very impressive Roman Amphitheatre and a short bus ride will take you into the centre of Trier where you can easily spend a day to see all the Roman sites and visit the excellent museums. After a hard days sightseeing there can be no better way to spend the evening than drinking some of the excellent Kraft beers either in the first class restaurant or in the more cosy pub area. 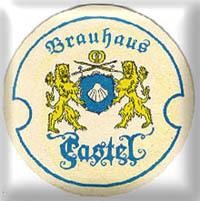 Beers tasted include a pale, unfiltered, well carbonated Helles which is served at the perfect temperature for a change. Not too bitter and with a good head, this refreshing, well balanced beer leaves a mild yeastiness on the palate and the overall impression is of a malt based fruitiness which predominates over a well judged hop blend. A very malty, smooth and slightly sweet Dunkles is also available which like the Helles is exceptionally well balanced and a perfect example of the style. Finally a pale coloured seasonal Maibock was tasted which has a light and flowery nose with a taste which is sweet on the palate, but not cloying due to a finely balanced bitterness/dryness. Many other speciality beers are now available throughout the year including an India Pale Ale. The hearty menu should be able to accommodate most culinary desires but it is particularly worth trying the excellent Treberbrot and Griebenschmalz as an entree. Overall, one of the very best addresses in Rheinland Pfalz. 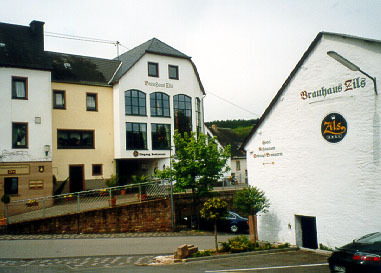 Southwest of Trier is a brewpub which is really off the beaten track called the Mannebacher Brauhaus. 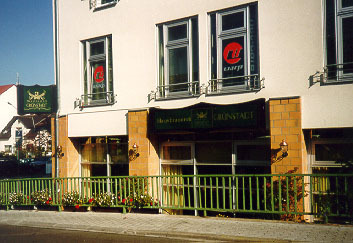 The address is Hauptstr. 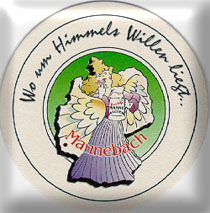 15, 54441 Mannebach. Tel: 06581 99277 Fax: 06581 99279. Not far from the border with Luxembourg, the Brauhaus also has excellent very reasonably priced accommodation with an antique style throughout. Hotel Tel: 06581 995299. Some further information can be found on its own Website. The pub is very welcoming and has a cosy rather confined atmosphere especially in the enclosed cellar bar. 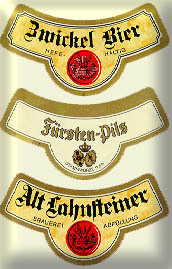 Brewer Hans-Günter Felten produces some very individual outstanding beers which use Hallertau hops throughout. These include a hoppy, very cloudy and yeasty Helles with a slightly sulphurous odour which has a very complex taste, slightly sweet and yeasty with a touch of fruitiness. Also available was a slightly stronger, slightly darker Weizen Maibock with a pear drop aroma and a taste similar to the Helles but more fruity. These beers are a meal in themselves but they also make a fine accompaniment to the good typical regional cooking which is also available. 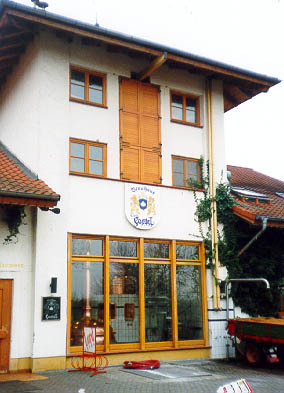 A new brewery opened in February 1999 in the town of Grünstadt which is situated to the NW of Ludwigshafen on the edge of the Pfalz hills, an area better known for its wine growing than for beer. 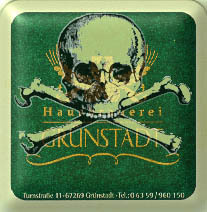 The Hausbrauerei Grünstadt can be found in the Turnstrasse 11, 67269 Grünstadt, Tel: 06359 960150, Fax: 06359 840798 and is run by Klaus-Peter and Ulrike Haußler who come from Speyer which is also known for its quality beer. Open every day from 11 am the brewery serves Hell, Dunkel and Weizen beers as well as occasional special brews. In the food section are a selection of local dishes with "Martins-Goose" as the particular speciality. The Hell has a pale golden colour which is slightly cloudy and only a mildly hoppy aroma. In taste the hop character comes forward with a lively fresh aftertaste and is a fine beer of this style. The Dunkel has a chestnut brown colour and is very smooth with a strong roast malt aftertaste. Perhaps the best dark beer in Rheinland Pfalz with a quality which equals the excellent dunkles of the Körpricher Landbräu in Saarland. Nikolausbockbier should also be available at the brewery from the 4th December. News 2009. 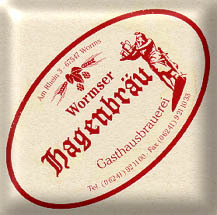 Unfortunately brewing stopped in Grünstadt last year and beers were being sourced from Hagenbräu in Worms. It is hoped that in-house brewing will be resumed in the near future. News 2015. Does not appear to be a brewery anymore as they were offering Hacker Pschorr beers on the new website. The city of Worms is situated on the west bank of the river Rhine. It is believed that a settlement was founded here over 6000 years ago and the city has existed since roman times although it has been raised to the ground a few times particularly in 1689 and 1945. 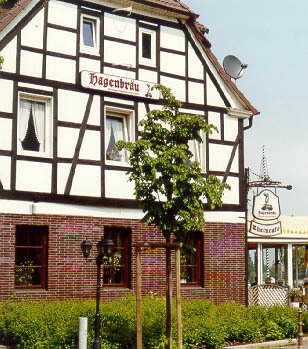 The Hagenbräu brewpub can be found on the river bank just over the Rhine bridge to the north at: Am Rhine 3, 67547 Worms, Tel: 06241 921100, Fax: 06241 9211033. This excellent brewpub has plenty of seating both inside and outside and offers a high quality of beer with seasonal specialities as well as good meals. The principal beers are a 11.6% Stammwürze Helles which has a malty nose and has a lightly (probably dry) hopped and slightly fruity taste. An excellent refreshing example of this beer style. The second year-round beer available is a 12.5% Stammwürze Dunkles which is in fact very light in colour (rather too light to be called a classic Dunkles), well balanced with a more malty nose and an especially strong malty aftertaste. One seasonal beer tasted was a 16% Stammwürze 7% Alc. 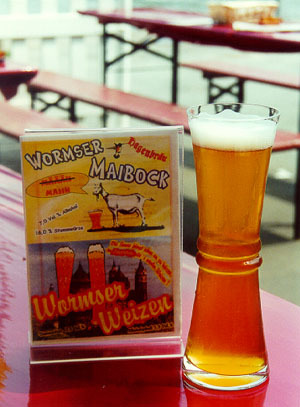 Maibock which is very pale, almost clear, very fruity and lively. Although this is really a Helle Bock rather than a classic Maibock this beer lives up to the excellent standards of the other brands. The Winter Nikolausbock which is available in December is especially worth seeking out as it is one of the best examples of this style, dark, strong and malty. In Winter the beergarden is still partly open and covered by canvas with huge gas heaters inside to keep it warm which is quite unusual. Also available from the brewery are a Summer Weizen and a 38% Alc. Bierbrand. 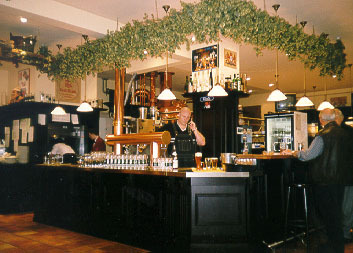 The Hagenbräu also organises beer seminars and has its own website at Hagenbräu Gasthausbrauerei. Sitting outside with a Helles and watching the barges go by on the Rhine is a rewarding experience which is highly recommended.